L: 38" x W: 43" x H: 40"
Tompkins Power Glider Recliner Settle back and relax with the comfortable, yet chic Tompkins power glider recliner. It features bonded leather upholstery complemented with attractive topstitching and track arms. Easily find your perfect resting position with infinite recline options plus a power headrest. With Tompkins, you'll get the ultimate sitting experience. Settle back and relax with the comfortable, yet chic Tompkins power glider recliner. It features bonded leather upholstery complemented with attractive topstitching and track arms. Easily find your perfect resting position with infinite recline options plus a power headrest. With Tompkins, you'll get the ultimate sitting experience. Chair's body and arms are covered in semi-aniline leather that is colored all the way through and topped with a protective coat for a uniform look and added longevity, while the back and sides are covered in a matching blend of leather and leather-look fibers, so you can enjoy the luxurious look and feel of leather for less. This chair is very well made! The USB port is brilliant!!!! The chair is so comfortable and the motor is quiet!! The only thing I would like it to do is to lay flat when fully reclined! The material is soft and buttery!!! Very nice and oh comfy!!! My sales person (Anderson in Waterford, CT) was fantastic! He gave us our own space and was in reach when we had any questions. He was very well versed on your products!!! The next big item is going to be a mattress and I will ask for Anderson once again! Thank you! After trying dozens of recliners my husband chose this one and is very pleased with it. He is 6' 4" and this recliner is just the right size to support his legs and give him a comfortable head rest. The continuous electronic controls make it easy to find the best position. It looks and feels great - much better than more expensive recliners we looked at. room. Reclines so easily. It is a piece you can utilize anywhere. We love it! It was a Christmas gift & the best chair we e’ve ever owned. Top quality in materials and craftsmanship . Very comfortable with extra cushion on foot piece. Love the power settings. I have very specific needs in a recliner due to a disease I have that affects my spine and joints. This chair is fantastically comfortable and has so many adjustments that I can always find a comfortable spot to be in. The leather seems very rich and it appears to be well made. It was delivered on time and VERY rapidly. If you go tot he R&F in Stroudsburg PA ask for Ella SHE IS AMAZING!!!! Really knows the store and her products and will narrow your selection to your requirements very quickly. 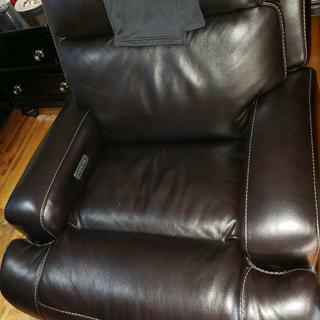 This recliner is a rich brown soft leather, and is so comfortable and roomy. The tilting headrest is a great feature for watching tv or reading while reclining. It is a beautiful addition to our room. Comfortable recliner that looks great! Handsome, sturdy, great quality, extra wide seat, extra wide footrest, comfortable, adjustable headrest, glider. Doesn't recline as much as other chairs, control buttons awkward to use, in sitting position the lumbar support makes you feel as if you're not getting deep into the chair. We purchased this piece for my husband to sleep on after his emergency open heart surgery just before Christmas. Our previous recliner was tiny and uncomfortable but this purchase is absolutely comfy and very attractive. My husband loves it and is getting his much needed rest and we are so grateful. Our salesperson, was a wonderful gem! When we walked in and advised what we were looking and why, he quickly sat my husband down in a wheelchair and wheeled him around the store showing us all the motorized recliner options available to us! He was so great! We love your store! Thank you! Happy New Year! Haven't even had this glider recliner a week yet and I had to call for service. I was reclined with my legs up, pushed the button to bring the legs back down. Got up to answer the phone and when I returned to chair I pushed the button the leg portion of the chair would move. Called for service and I have to wait almost another week for someone to come and look at the chair. Is the back removable to fit through narrow doorways ? BEST ANSWER: Hello Rob, thank you for your interest in the Tompkins Power Glider Recliner! Yes, the backs are removable for delivery purposes. What color(s) it comes ? BEST ANSWER: The Tompkins power flider recliner comes in Blackberry, which is a dark brown fabric, for immediate delivery. We also offer special order fabrics for this recliner as well. Please visit your local showroom for fabric color details!